“The Obesity Code,” to the fasting uninitiated, is tough love. Is there an simpler path to start? As a reader of the book in spring 2017, I did NOT have a support team. The IDM Facebook group did not yet exist. IDM was just getting its internet coaching team started. I watched Dr. Fung’s videos; “The Aetiology of Obesity” series is particularly edifying. I, nonetheless, needed something easier than jumping directly into 24 hour alternate daily fasting. Dr. Fung deploys Hormonal Obesity Theory to lose weight — to mobilize fat from low insulin levels. I started by having my evening fast last for as long as possible, thus keeping my insulin level low. I also followed Dr. Fung’s advice by eliminating snacks and sugar sweetened beverages. I called this my 12+ Protocol. But it was working. I started reversing my main marker of pre-diabetes, Hb A1c, in 5 weeks, 6.1% -> 5.9%. I dropped about 10 pounds. By November 2017, after 6 months following 12+, my Hb A1c was normal, < 5.7%. Most of my family members have adopted 12+ and have seen excellent results. Dr. Fung’s Hormonal Obesity Theory works. As a theory, you can use it to design different therapies. I suspect Dr. Fung’s flexible advice devolves from this truth — Hormonal Obesity Theory can be applied in many ways to manage one’s weight. In the below table, I started using Hormonal Obesity Theory on Juneteenth, June 19, 2017. It took me about 4 months to migrate to eating just two meals a day, 2MAD, with a 16 hour fasting window. I was becoming adapted to using my stored fat. Over that time during late 2017, I lost 30 of my 40 pounds between my annual physicals and had a high normal Hb A1c. While my fasting glucose was still borderline pre-diabetic, my doctor was nonetheless ecstatic. causes all of the energy reserves distributed around your body to be tapped — creating space for the mobilized fat to be metabolized. But 12+/fasting still seems much easier than my prior efforts at losing weight — efforts that had always failed. Always. Has this low insulin pattern caused some other changes? Yes. These short daily intermittent fasts have caused my body to become metabolically flexible. I can burn fat as easily as I burn sugar. It is a result of a low insulin lifestyle. I don’t become hungry as often. I’ve gained control over my response to food. I’ve become fat adapted and so can you. It is the super power conferred upon us by fasting — the more you fast, the more you can fast. I think becoming fat adapted is the most important goal to achieve in your weight loss journey. It makes everything easier. Becoming fat adapted takes time. It took me 4 or so months. People eating in a ketogenic fashion can force the transition in a few weeks. Nonetheless, 12+/time restricted feeding is a pattern I’ve maintained for 18 months while eating all kinds of food. I am confident that everyone can become fat adapted this way. My maintenance weight should occur with a normal Body-Mass Index, BMI, less than 25. In my case, that means weighing less than 174 pounds, about 100 pounds less than where I started. 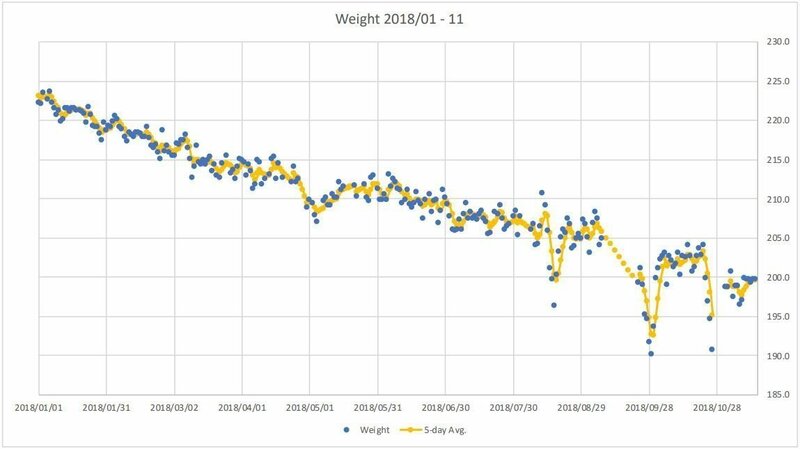 After dropping about 60 pounds, just over halfway to my normal BMI weight, 12+/time restricted feeding hit a wall; my rate of weight loss slowed down. This could happen for many reasons. I could have started eating sooner or more. Or, as I’ve lost a lot of weight, there is less of it coming out of my fat cells. For example, my hands and forearms are visibly thinner and vascular; I’ve had to remove links from my watch band. Is the lack of arm fat a cause of slowing weight loss? There is less to lose? Regardless, slowing or stopping weight loss is a common phenomena. It is frequently where I’ve failed at losing weight before. This is a dangerous time; the time where, heretofore, I fell off the wagon and yo-yo-ed my weight back up. Could fasting see me through? You can see the plateau between March through May 2018, below. I have a higher fasting glucose level than my doctor or I would like. Is that the cause of my plateau? As ketones are a proxy for low insulin levels, what do they look like? I purchased a Keto-Mojo meter in June to find out. Turns out that many mornings I have both high glucose, 95-103 mg/dL, a pre-diabetic level, and a modest level of ketones, 0.3-0.9 mmol/L. In other words, my insulin level is in check; I’m reliably producing ketones. (When I purchased the meter, the sales person tested me and I had a glucose 110 mg/dL and ketones of 1.3 mmol/L. She had never seen that high a combination before.) Before purchasing the meter, I had tried adding a once a week 23 hour fast. It wasn’t hard and you can start to see modest movement in my trend-line. But it wasn’t working very well either. My high glucose level is, I believe, a problem. Time to call in the big guns from IDM. Their books got me this far, perhaps their insights can help me push this through to completion? Megan Ramos, IDM co-founder, was speaking at a nearby keto conference and she was very welcoming to me and offered to advise me. After I acquired two weeks worth of data from my Keto-Mojo meter, I set up an appointment with Mrs. Ramos. One approaches a coach to learn, to help you see your current situation correctly and improve it. As someone trained in the sciences, I really needed to remember this. While I had read Dr. Fung’s books and watched his and Mrs. Ramos’ many recorded lectures, I still did not have much experience. I had n=1 experience; IDM has n=5,000+ experience. This was important because Mrs. Ramos had a different interpretation of my stall than I did. To her, my 12+ pattern had not allowed my liver and pancreas to fully heal from my pre-diabetes. Multiple 36+ hour fasts drain your liver of glycogen and start working on reducing ectopic and visceral fat. The longer fast forces your body to switch from stored glucose. Her theory was that my glucose was remaining high because my liver and pancreas were still operating based upon my insulin resistant history, that I had not reset this hormonal set-point. I needed longer fasts to drain my liver of glycogen and, thereby, reset the set-point. Her advice: up my fasting game to include at least two 36+ hour fasts per week. My response: It’s complicated. I work with a personal strength trainer twice a week. This has also helped me get healthier, albeit in a different fashion than fasting. As my workouts are very intense, I need to eat afterwards. I am loath to change something that is also working. Furthermore, I’ve solved the acute pre-diabetes problem and I wish to reserve dietary flexibility for a social weekend. Hence, I was willing to adopt a 40 and 23 hour fast per week. I make up for this by having a 5 day fast per month. (Socially, I found that it was easier to just block out a week a month versus juggling multiple 36+ hour fasts per week.) I also decided to get a DXA scan, Dual-energy X-ray Absorptiometry scan, before I started my first 5 day fast. I wanted to record my baseline value of visceral adipose tissue, VAT, at 3.06 pounds. Allow me to emphasize, having a coach in your corner really helps you succeed. Fasting is a hard path and there are many in our society who will try to dissuade you from continuing. Even I, a known curmudgeon and generally crusty individual, am subject to social pressure. Hence, just having Mrs. Ramos’ imprimatur to push forward into deeper fasting really helped. She helped me have confidence that I could do this. And I did. Don’t hesitate to recruit allies into your corner. I joined a small group of extended fasters on Facebook, WTF, Willing To Fast, that helped me. You need supporters too. IDM’s Facebook group is a good place to find allies. IDM’s subscription programs work well too. Mrs. Ramos was right. Her tactic, upping my fasting game, worked. I needed to hit my central/ visceral obesity directly with longer fasts to lower my glucose level. Home glucose meters are highly variable and my October average of 92 mg/dL also contains a reading of 78 and 102. My morning fasting glucose is far from stable. More healing is required. My doctors would like to see my average glucose level below 85 mg/dL. I’m about to purchase a continuous glucose monitor to help me finish healing from diabetes. My job is not yet done and I’m keeping the longer fasts in my protocol. Reversing 45 years of obesity doesn’t happen in a month or even a year. I’m 18 months into living the fasting lifestyle and I expect to be managing my weight via fasting for many years into my future. Hormonal Obesity Theory For The Win! HOT FTW! My Bride, Daughter, Doctor and myself are celebrating this change in my life’s prospects. By every measure, I am healthier now than three years ago. This is primarily due to adding fasting to a twice weekly strength training regimen. 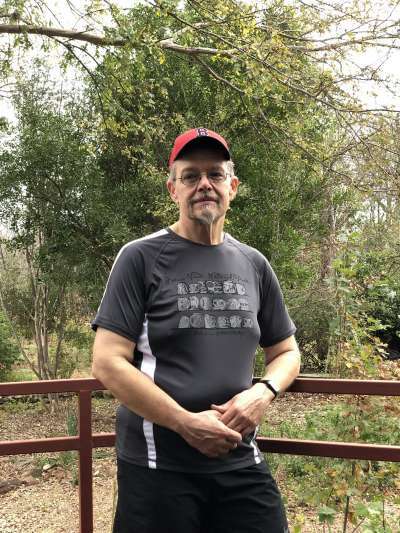 By addressing my pre-diabetes before it became full blown diabetes, I have likely added years to my life and have certainly improved my quality of life. You can too. But I’m not yet done. I still have to bring my weight down to normal BMI levels and keep it there. I have to get my glucose level reliably less than 90 mg/dL. I know how to get there and have confidence in the fasting path. Weight loss takes time; it is important to get started. I took a different path than Dr. Fung describes in his books but one supported by Hormonal Obesity Theory. While I ended up in a similar place using alternate daily and extended fasting, I gained a real benefit by becoming fat adapted. By reading “The Obesity Code” carefully, I found an easier but slower path. I’ve lost over 70 pounds, 286,363 kilocalories, of fat. At 2,000 calories per day, that is 143 days worth of meals. Using Mrs. Ramos’ preferred pattern, which yields about a half pound loss per 36 hour fast, I would have taken 280-320 days to lose my weight. I took about twice as long. I’m OK with that. There are many fasting paths to good health. Thank you IDM, Mrs. Ramos, and Dr. Fung. You’ve helped me find my path to weight loss success. Keep Calm and Fast On. Disclosures: I have no financial relationship with IDM. I’ve purchased Kindle editions of “The Obesity Code” and “The Complete Guide to Fasting”. I purchased the paper edition of “The Diabetes Code” to gift to my family doctor. This article is my effort to pay back to the community the gift of Mrs. Ramos’ ad hoc coaching. Women and Fasting: Does Fasting Affect Your Cycle? Thank you for sharing your story, it is very personal and inspiring! What a fabulous story and inspiring story! WTG, Andrew Donoho!! Lots of great info here on how this determined man tailored what he learned into a lifestyle that would work for him and his life! More success found by learning & practicing the principles taught by the wonderful Dr. Jason Fung & fabulous Megan Ramos at Intensive Dietary Management! #FungFan #RamosFan #IDMFan #ProlongedFastingForHealingFan #HealthyKetoAndIF4ever 🙂 <3 <3 <3 xoxo xoxo Best wishes! You are very kind. Most importantly, I think you twigged to the main point — that there are many paths to fasting success. I have found your account inspirational particularly the emphasis on patience. Impatience has always been my downfall. I am 75 and just starting the 42 hour fasting protocol. Anyone out there like me please tell me. Jan H. Hello. I’m 70 years old . Just finishing the 4th day of water/coffee only fasting. Not sure how long will fast but feel great! Pain in muscles & joints already less. Walking better. Lost 12.5 lbs. Plan on trying 16:8 after this fast . Fasting is a flexible strategy. You can use all of the tools. There isn’t one answer. You got it. Persistence pays off. Inspiring! Thank you for sharing your story! What a great story!! so encouraging and congratulations to hour successful transition. Thank you for sharing- inspiring. Sorry, I did not quite get what 12+ means? While I didn’t detail this in the post, 12+ means always fast for at least 12 or more hours. Also, leave at least 4 hours between meals. Finally, minimize fast carbs. If you always try to increase the length of your evening fast, then you will eventually get up to a 16 hour fast and be eating two meals a day. And you’ll be fat adapted when you get there. Many of the fasting patterns described by Dr. Fung assume you are implementing a 16:8/2MAD pattern. I’m sure this path will help you reduce the severity of your T2DM. And you’re welcome. Best of luck. You’re in good hands following Dr. Fung’s pattern. Andrew – great story! And well written too! I’m curious to know how you structured your extended fasts compared to your workout days? So you start an extended fast on a workout day? Or end it on one? Or something else? Thanks for sharing!! The Intensive Dietary Management (IDM) Coaching Program provides the education, guidance, support, and structure necessary for successful weight loss and type 2 diabetes reversal. The IDM Program is an online coaching program to naturally treat weight and other metabolic related issues such as type 2 diabetes, polycystic ovarian syndrome (PCOS) and fatty liver through lifestyle modifications without the use of medications, supplements or surgery. If you have questions please feel to contact us at info@idmprogram.com.